This is my new chair. 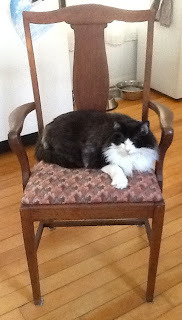 Ernie has been breaking it in almost nonstop since I brought the chair in the house yesterday afternoon. The chair’s sedate life is about to come to an abrupt end. For almost a year it’s been in the back of my mind that I wanted to do something to/with chairs. I have a wood burning tool kit, jewelry saws with sharp thin blades, paint, inks, nails, birch bark, who knows where this will go. For now, the chair is going to have to trust the processor.